Running on Pixie Dust: 5 Reasons Why Disney in July is Fun! 5 Reasons Why Disney in July is Fun! Summer is the most popular season for family travel in the U.S. While the kids are out of school in most parts of the country, families take advantage of the warm weather to spend some quality time together on some amazing vacations. For some though, Walt Disney World is immediately removed from the list of summer vacation destinations. I understand. Some worry about how hot and humid Florida summers can be while others are fearful of facing large crowds. Well folks, as someone who has travelled to Walt Disney World during the summer twice before and about to embark on another trip in less then a week, I can reassure you that you can indeed have fun in Walt Disney World in summer. Check out these 5 reasons why your Walt Disney World vacation is still fun - even in July! 5. Great water parks! 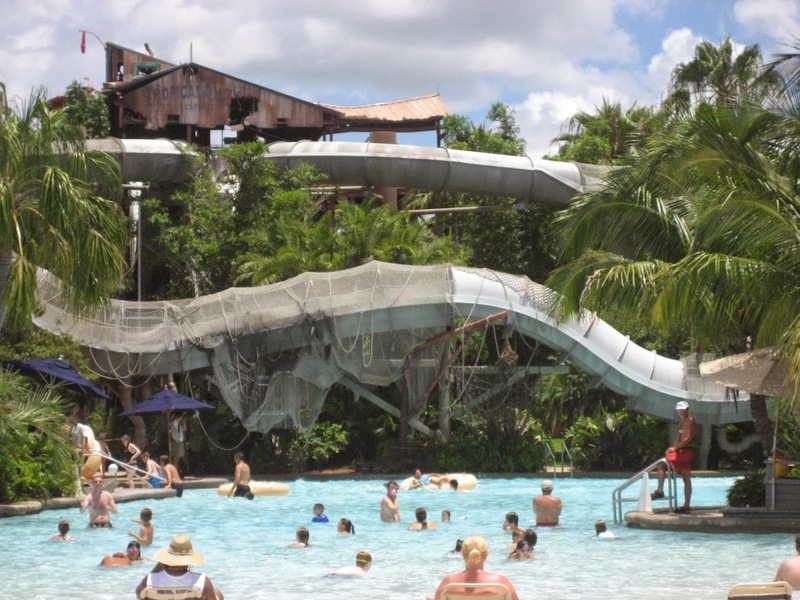 - Walt Disney World is home to, not one, but two amazing water parks. Typhoon Lagoon and Blizzard Beach provide lots of family entertainment and a great way to beat the heat. If you visit Walt Disney World outside of the summer months, you may not get to experience both as in the "off-season" they typically only have one water park open at a time. Typhoon Lagoon is the perfect place to take a break during your summertime Disney vacation! 4. No school guilt - While my two are still too young to be missing school when we travel during the school year, I know as an educator how difficult missing a week of school can be for students. Traveling to Walt Disney World in the summer means that you can have all the Disney fun you can manage without any of the guilt associated with pulling your kids from a week of school! 3. Later park hours - This is something I didn't really appreciate until our November trip this past year. I'm just used to parks staying open later and was amazed to see regular park closing times of 8PM for Hollywood Studios or 10PM for Magic Kingdom. When you add in the early Magic Kingdom closings for special events like Mickey's Not So Scary Halloween Party or Mickey's Very Merry Christmas Party (7PM closing time) you have less time to fit in your favorite attractions. 2. Your Resort Pool - Disney resorts (an even the off property resorts I've stayed at) have some amazing pools. The pools are not-to-be missed essentials on a summer vacation, but are often overlooked when traveling in the cooler off season months. Of the Disney property resorts I've visited, my favorite pool so far as been at Port Orleans Riverside. The water slides are great - even for big kids! 1. It's Disney! - And who can say no to a Walt Disney World vacation anytime of year?!?! Regardless of when you travel, the parks offer a great variety of activities and even in the Florida heat you can find ways to stay cool and have a great vacation.